Kunst am Moltkeplatz KaM e.V. send their very best wishes for a Happy New Year 2016 to all members, friends, and neighbours. "Kunsthaus NRW / Northrhine-Westphalia Art House Kornelimünster"
on 28 Nov 2015, there was a guided tour for members and friends organized by KaM of the Northrhine-Westphalia state institution "Kunsthaus NRW / NRW Art House Kornelimünster". Dr Marcel Schumacher, head of the institution since April 2015, supports the Moltkeplatz as curator of the KaM project "junge Kunst am Moltkeplatz / young Art At The Moltkeplatz". In front of the main entrance to the former "Reichsabtei / Imperial immediacy abbey" building, the group of members and friends of KaM was "greeted" by artwork of Ansgar Nierhoff (represented at the Moltkeplatz with his work Paarweise / In Pairs), and Christian Forsen (who, in 2010, was the first artist of the KaM project "junge Kunst am Moltkeplatz / young Art At The Moltkeplatz", and took part in the action Kunst im Wohnraum / Art in The Living Room in Essen that same year). Read more about the tour here. on 08 November 2015 Michael Krafft provided a set of photographs taken at the sculptures park in the autumn environment; click here to view them. temporary sculpture "Korridor" of the artists´ group Konsortium, and removed all woodwork. View across the southern part of the sculptures park after the removal of "Korridor"
on 06 November 2015 the temporary sculpture "Korridor" was dismantled. Lars Breuer, Sebastian Freytag und Guido Münch (the artists comprising the "Konsortium"), and five others unscrewed the sheathing, and stored it for removal, which is to occur when the wooden sub-structure will also be removed. The Südanzeiger carried a picture of the dismantleing on 14 Nov 2015; clickhere. Sunday 01 November 2015 saw the closing event for the temporary sculpture "Korridor" of the artists´ group Konsortium which had been on display at the sculptures park Moltkeplatz for the past year. Korridor will be dismantled during November. Even though there were numerous other events in town, more than 60 visitors followed the invitation of the association Kunst am Moltkeplatz KaM e.V. to bid farewell to this fifth art work within the series young Art at the Moltkeplatz / junge Kunst am Moltkeplatz. Enjoying the late autumn sun in the park visitors listened to the introduction, and witnessed an interesting discussion round - chaired by Harald Goebell - with the three artists Lars Breuer, Sebastian Freytag, and Guido Münch, their "Korridor", and their wider ideas. This was followed by an informal get-together under the beautiful trees with Indian Summer-like foliage. The WAZ newspaper of 28 Oct 2015 had carried the invitation for the finissage; click here; and the Südanzeiger newspaper on 31 Oct 2015; click here. "Korridor" at the Moltkeplatz on 01 November 2015; more about "Korridor" here. "Korridor" is being sponsored and supported by Allbau Stiftung, Sparkassenlotterie "PS-Sparen und Gewinnen", Ingenieurbüro Lars Römling, Nolte Ingenieur Holzbau GmbH, and TRINAC GmbH. Aerial photographs of the RVR metropoleruhr internet site www.luftbilder.geoportal.ruhr show, among other, the two-part temporary sculpture Korridor of the artists´ group "Konsortium". This work has been set up by KaM e.V. 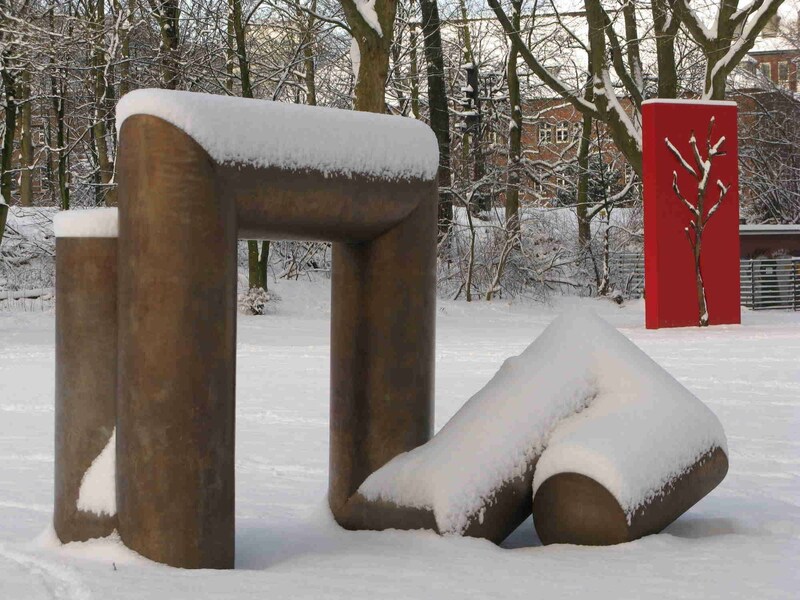 in 2014 within the project junge Kunst am Moltkeplatz / young Art at the Moltkeplatz and will be on display until Nov 2015 (the sculpture Hannover Tor by Friedrich Gräsel is visible to the top right). To view the aerial photographs: call www.luftbilder.geoportal.ruhr . Select "Stadtplan" at the upper border (which is the default); enlarge scale by clicking the top right + sign; use mouse and cursor to move the area displayed to the Moltkeplatz (approx 800 meters south east of the Essen Hbf main railway station); change to "Luftbilder" 2011-15 (the red tennis courts at the southern part of the Moltkeplatz are quite prominent); zoom to maximum scale. the students of the 2nd grade art class of the International School Ruhr - who are currently dealing with the topic "Community / Nachbarschaft" in another subject - and their teacher Daniel Niemann visited the sculptures park. After a general introduction to the park with its old trees and all sculptures the group moved on to Gloria Friedmann´s "Denkmal / Memorial" (the tall red conrete wall with the dead tree), and Ansgar Nierhoff´s "Paarweise / In Pairs" (the twin steel sculpture) to discuss these works in more detail. Through the "Korridor" of the sculpture of the same name everybody returned to the street and back to the school. Corinna von der Heyde and a group of performers visited the sculpture park at the Moltkeplatz. It was the object of this visit to learn more about the sculpture ensemble and the individual art works in order to prepare for a dance performance in the park. Corinna von der Heyde and the group plan to develop the choreography and to do the actual performances incorporating the sculptures. During a guided tour around the ensemble with the various works lots of explanations and answers to questions raised were given. The association Kunst am Moltkeplatz KaM had invited their neighbours, friends of the Moltkeplatz, and other persons interested in the arts to their annual Skulpturen­fest / sculptures festival. The date was one week before the beginning of the summer school vacations. Despite temperatures lower than appropriate for mid-June, attendace was high... in fact, more people joined the festival than ever before. The program included official addresses, among others given by the City of Essen mayor Franz-Josef Britz, and the chair of the Essen "Jury Kunst im öffentlichen Raum / Jury on art in public spaces", Gerd Mahler. Also, a walk-through temporary art work was jointly set up. Most of all, though, time was spent talking to friends, old and new ones, and enjoying the beautiful setting. More about the Sculptures Festival here. One day prior to the Sculptures Festival the artist Renate Neuser had installed her temporary sculpture Balkongold at the balcony of a house facing the sculptures park. within the annual project "Kunst im Wohnraum / Art in the Living Room Essen" Lars Breuer put on display works in a private flat at Moltkeplatz 9. Lars Breuer is a member of the artists´ trio "Konsortium", who have set up in November 2014 their taller-than-man black-and-white twin sculpture Korridor . This temporary work in the sculptures park will be on display thru November 2015 within KaM´s project "junge Kunst am Moltkeplatz / young Art At The Moltkeplatz". Lars Breuer was present on 30 May 2015 and gladly provided explanations in respect of his work "Esplosione" of 2012 (consisting of a 100 x 700 cm wide banner with this lettering, and thirty pictures projected onto a wall) which was on display for the day, and the associated cycle of his works. In addition to catalogues of Lars Breuer other publications were available on "Konsortium" works ... among them a Leporello folder on "Korridor", fresh out of the printing press. More about this eight page folder here (entry dated 15 May 2015). a small group of art enthusiasts from Düsseldorf visited the Moltkeplatz. Within a guided tour by KaM the sculptures were outlined and discussed. This was followed by a walk around the interesting neighbourhood of the Moltkeviertel ... all in lovely spring sunshine. The visit ended with interesting discussions. Kunst am Moltkeplatz KaM e.V. is mentioned in the brochure "ESSEN.KULTUR.2015" published by the Essen Marketing GmbH EMG. To download the full EMG brochure "ESSEN.KULTUR" (6.2 MB pdf) click here. KaM is mentioned on page 29. In printed form the brochure is available from the Tourist Center opposite the main railroad station (Touristikzentrale, Am Hauptbahnhof 2). For additional EMG brochures and flyers click here . members of the association KaM have participated in this year´s pico-bello-SauberZauber /"spick-and-span magic-clean" action of the Ehrenamt Agentur Essen. All kind of refuse was collected from the green around the sculptures and the vicinity for removal by the city. Despite members of the association KaM regularly collecting trash from the sculptures ensemble and their surroundings quite a collection of stuff was removed in this action: bottles, plastic packaging, concrete in a bag and in various pieces, bucket full of paint etc. the 5th grade students of the International School Ruhr - with their teacher - spent time to learn more about KaM, the Moltkeplatz, and the art works of the sculptures´ ensemble. A well prepared question-and answer-round about KaM and the sculptures (held in the school) was followed by a visit of the sculpures´ park. Here the various sculptures were explained and discussed. the entry about the association Art at the Moltkeplatz / Kunst am Moltkeplatz on kunstgebiet.ruhr, the digital art guide for the Ruhr District - which was initiated in 2014 - has been expanded. Also additional references to the art work at the sculptures´ ensemble have been added. For the entry about KaM click here. on 24 Jan 2015 snow covered the scultures park - for the second time this winter. For some pictures taken during the snow fall click here. the SELK church at the Moltkeplatz, an immediate neighbor of the sculpture park, organized the first event within their "Art meets Church / Kunst und Kirche treffen sich" series. Accompanied by performances of baroque music, the artist (and architect) Peter Brdenk provided comments on the light installation he had put up for display in the church. Provost Klaus Pahlen invited everybody to interpret what was to be seen and heard. More here.